AUSTIN — Starting Saturday June 1, everyone in the Austin area will have to dial “512” when making a phone call. Dialing 10 digits is preparing the area for the new area code that will be added in July. Get ready to welcome 737. The growth of Austin, along with demand for new wireless numbers, is taking its toll on 512. She says people who already have a 512 will not lose it. 512 is one of the four original Texas area codes. The other three are 214, 713 and 915. The new 737 will be the 25th area code in Texas, and the first new one in 10 years. “It just shows that our city is really growing, which is great. And other cities like Houston and Dallas have other area codes too,” said Austin resident Philisa Giannukos. Austin’s new area code might remind you of a 737 plane. Southwest airlines flies only 737’s and that airline carries one-third of all passengers at ABIA, with 68 flights to and from a day. The Public Utility Commission says we shouldn’t need another new area code until 2047, but by then who knows what the phone system, or even Austin, will be like. Three months in, how’s the bag ban going? Are you remembering your reusable bags yet? It’s been almost three months since Austin’s reusable bag ordinance went into effect, and like just about everyone else in the city, I’ve had my ups and downs getting used to it. In today’s Metro section, Sarah Coppola reports that the city has received 19 complaints from March 1 to May 15 about retailers not complying with the new rules, which prevents stores from giving out single-use plastic and paper bags. About 60 retailers, including Terra Toys and Academy Sports, have received short-term variances to either comply with the ban in alternate manners or to use the rest of the single-use bags they have in stock, but almost all of the rest of the retailers in the city limits have found a way to sell reusable bags, encourage customers to bring their own or, in some cases, give away thicker, reusable plastic and paper bags. And for all the informal complaining from customers who think the ban is an infringement on their right to free flimsy bags, only 44 have officially called the city to register their dissent. Every time I go to the supermarket or store, I’m impressed with how many people walk into the store with reusable bags in hand, and it’s nice to get 5 cents per bag knocked off the bill at retailers like Target and Sprouts, which give discounts for people who BYO(bags). It wasn’t until two weeks ago that I saw a customer at H-E-B using the “emergency option” to get her groceries packed in the single-use bags for $1. And to stay ahead of the germs that may or may not be taking up residence in my canvas bags, I’m trying to remember to wash them in the laundry about once a month. If you’re still unclear about which bags are OK and which bags aren’t, the city has launched BringItAustin.org to help citizens navigate the new rules. How is the bag ban going in your household? Are you missing those flimsy bags or shopping elsewhere to get them? Have you noticed a longer wait time in the check-out line to accommodate the new bagging system? Every other Wednesday from May 29th to August 7th, Zilker Park will be filled with thousands of people, blankets and lawn chairs, families and music lovers. As Austin’s largest FREE concert series KGSR’s Blues on the Green is consistently ranked as a top annual entertainment event and has become a staple of the Austin lifestyle and a very casual and comfortable experience. JOIN THE BLUES ON THE GREEN TEXT ALERT CLUB — text “BLUES” to 29217 to get access to exclusive contests and information sent to your mobile device regarding KGSR’s Blues on the Green. 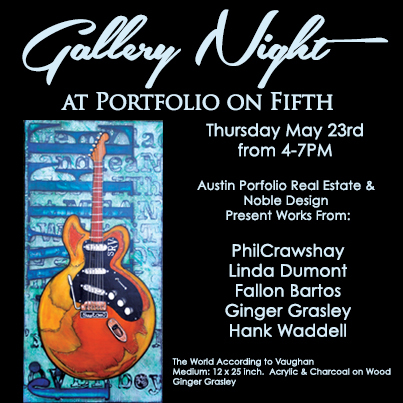 Mark Your Calendars: Gallery Night! Hey hipsters – lock your bike up! While watching the news last night I stumbled upon a piece on bike theft. Hello theft ring!!! Lock it up people or the likely hood of you getting it back in time for ACL or any of the other thousands of festivals here in Austin are slim to none. Check out THIS MAP where APD tracks bike thefts here in Austin. Our tax dollars at work. AUSTIN — The University of Texas at Austin is employing a high-tech tool to catch bike thieves. Bicycle theft continues to be an issue in Austin. According to city and University of Texas theft records reviewed by Defenders, thieves have stolen at least $2 million worth of bikes in Austin in the past three in half years. More than 2,000 bikes have been stolen in the past year –that’s one bike stolen every four hours. “I typically lose about one a month,” said Mark Mitchell, owner of Barton Springs Bike Rental across from Zilker Park. Mitchell claims that he has had more than one hundred bikes stolen from his business in the past few years. University of Texas Police Officer Ruth Jasso says her department takes bicycle theft very seriously. Jusso’s department is now using GPS technology hidden in bikes across campus to catch the crooks. Campus police lock bikes, with a hidden GPS, in high-theft areas and wait for someone to take the bait. A computer program then notifies police dispatch of the theft, and the chase is on catch the thief. The GPS tool helps police track and locate bike crooks as they try to get away. Jasso says that the bait bikes are working. “We do have repeat offenders, but we’re not seeing them as often as we used to,” Jasso said. Most bike thefts strike off-campus in the Austin jurisdiction. A few years ago, Mitchell told Austin PD, that he would pay for bait bikes, and the GPS technology if the city created its own program. “I think it would cut down the rings in Austin and take them to other cities,” Mitchell said. Commander Jason Dusterhoft with the Austin Police Department says the city did have its own bait bike program a few years ago, but no one stole a [bait] bike. Dusterhoft admits that the technology at the time wasn’t perfect. “And that’s not to say we can’t try this again. I’d like to look at that and the feasibility of it, and in the end, it might be better to make joint partnerships,” Dusterhoft said. Dusterhoft says he now plans to reach out to UT Police and meet with Mitchell about his offer. We all know Austin City Limits a major music festival in Austin, TX. SXSW happens in the Spring, but pales in comparison to the epicness that is Austin City Limits. This year the festival will be two weekends. October 4th-6th and the 11th-13th. The complete 2013 schedule went live last week. Watch the video to see the complete list of bands. Finding the perfect Summer Camp just got easier. See below a full list of 2013 Sumer camps around the Austin area. Find a more exciting, and memorable Camp experience this year for your kiddos.